THIS IS NOT AN NFL JERSEY. This is a hand autographed fersey of Tyler Boyd. You can view this item on the Prova website, it shows when and where the item was signed. Jersey size is XL. Boomer Esiason Signed Autograph Cincinnati Bengals Mini Helmet. Boomer signed this helmet nicely for me about 10 years ago. I received by sending through the mail. Thanks for looking! ATHLETE: Joe Mixon. TEAM: Cincinnati Bengals. This is a Cincinnati Bengals throwbackmini helmet that was personally autographed by Charlie Joiner with HOF inscription. This helmet includes a certificate of authenticity from James Spence Authentication (JSA) and Denver Autographs._x000D_. Ken Anderson Cincinnati Bengals Signed Mini Helmet, COA, "1981 Nfl Mvp"
Ken Anderson Cincinnati Bengals Signed Mini Helmet, COA, "1981 Nfl Mvp". Shipped with USPS Priority Mail. Team: Cincinnati Bengals. To ensure authenticity, the hologram can be reviewed online. Authentication: Fanatics Authentic. Player: John Ross. Display Cases. Semi Annual - Plaques/Collages. Ken Anderson was drafted 67th overall in the 1971 NFL Draft by the Bengals. Authentic Autographed Spalding Football. This was a recent estate acquisition. Football in very good condition. This was signed in person at an event in which the said athlete was in attendance. Signed by 8 Bengals Alumni players such as Ickey Woods, David Fulcher, and 6 others. I went to the Bengals 2017 Draft Party on 4/27/17 to get the autographs. 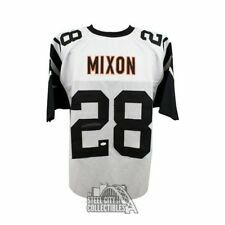 JOE MIXON AUTOGRAPHED CINCINNATI BENGALS CUSTOM JERSEY. HE HAS SIGNED A CLEAN SIGNATURE. JERSEY SIZE: XL. VERY RARE ITEM. THE PHOTO WAS CUT OUT OF A MAGAZINE. This is a Hand Autographed 16x20 Photo File Photo of AJ Green of the Cincinnati Bengals. You can view this item on the SpenceLOA website and it shows when and where the item was signed. This current Bengals Young Star Wide Receiver signed this jersey with a black paint pen. The autograph was witnessed by Beckett representative who witnessed and authenticated the autograph. Both the COA and jersey have matching serial numbers. Team: Cincinnati Bengals. To ensure authenticity, the hologram can be reviewed online. Authentication: Fanatics Authentic. Player: A.J. Green. Display Cases. Semi Annual - Plaques/Collages. Nick Roman. Ball is not inflated, and has not been cleaned. Visually the autographs are sharp and in great shape. We have made no attempt to clean the ball. It may shine up well. This is as it’s been kept for a couple of decades. You can view this item on the SpenceLOA website and it shows when and where the item was signed. A.J. Green Cincinnati Bengals Autographed Logo Football - Fanatics Authentic Certified. This Cincinnati Bengals logo football has been personally hand-signed by wide receiver A.J. Green. To ensure authenticity, the hologram can be reviewed online. FEATURED IS AN AUTOGRAPHED 8X10 ICKEY WOODS. A.J. Green Cincinnati Bengals Autographed Duke Football - Fanatics Authentic Certified. Team: Cincinnati Bengals. This football has been personally hand-signed by A.J. Green. To ensure authenticity, the hologram can be reviewed online. Hand-signed and inscribed in black felt-tip pen by Ickey Woods. Custom on-field style jersey. I actively added to my collection until 1991 when I went to college and took several years off. Nike on-field style jersey. Everything sewn on, size 54.